With orders for five superjumbos from Kingfisher Airlines, European aircraft manufacturer Airbus Industrie expects global contracts for this flying mammoth to jump by another 20 to 176 this year. "We hope some of these 20 new orders will come from India. But I don't want to predict who (will be placing these orders)," Airbus COO John Leahy told PTI on board the aircraft, which completed a special flight from New Delhi to Mumbai with 175 passengers on board. The A-380, which flew close to the ground and then dramatically took off again before finally landing at the Mumbai airport, has already landed at 45 cities across the globe. Airbus has been holding parleys with some Indian carriers, including Air-India and Jet Airways as well as the low-cost Air Deccan. in a full economy class configuration. Leahy said the Airbus would be delivering its first A-380 aircraft to Singapore Airlines this October, followed by 13 in 2008, 25 in 2009 and 45 in 2010. "If the Indian carriers can place their orders this year itself, they can be assured of the first deliveries by 2012. 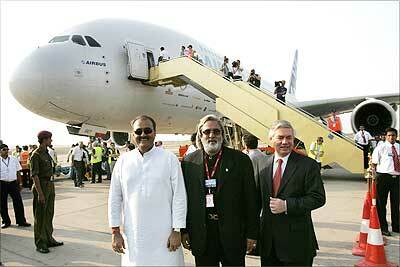 Kingfisher Airlines chairman Vijay Mallya (centre) is flanked by Union Aviation Minsiter Praful Patel and chief operating officer for customers at Airbus Industrie John Leahy in front of the A380 at the Indira Gandhi International Airport in New Delhi.